Girls like Margie make us stop and stare. It’s not just her pattern mixing, or her amazing street style. It’s her obvious joy in choosing outfits that reflect her passion and personality. Best of luck on your online vintage business, Margie! Introduce Yourself! What’s your name, where do you live, and what do you do? My name is Margie Ashcroft. 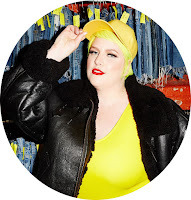 I am a stylist, fashion blogger of margieplus.com, and freelance fashion writer (I have plus size column on Luckymag.com twice a week) living bi-coastal. I have a very eclectic personal style. One day you will find me in creepers with leather leggings and the next in a mix of floral and sequins. I am a Kate Lanphear and Chole Sevigny fanatic, which totally influences my style. Do you have any fashion regrets? Or vice versa, things you’ll never stop wearing? Everything I wear and how I style it is totally a reflection of where I am at emotionally. I do not like to think of any of my fashion with regret, but rather as a transition period. With that said, looking back there have been a few questionable moments… I’m talking denim mini skirt and tube socks. I will never stop wearing classic leather moto jackets and anything sequin. I am inspired by all the amazing street style blogs the Internet has to offer (I don’t know what I would do without Street Peeper), fashion magazines, my surroundings, and the clothes I find on my countless thrifting adventures. Tell me about Margie Plus. What do you focus on? Any goals for 2013? For as long as I can remember I have been a plus size girl with an obsession with fashion and aspirations to work in the industry. Margie Plus was started when I was working at Lucky magazine as their Fashion and Beauty Blogger Conference event coordinator. I started writing my Margie Plus column for luckymag.com shortly after our last FABB when a Lucky digital editor suggested I start a fashion blog of my own. I had always wanted to catalogue my personal style with a blog and finally had the push I needed to do it. My goals for 2013 are to grow my blog, push my fashion boundaries, and most importantly inspire other plus size fashionista’s to take more risks with their fashion. My top Pandora stations of the moment are Bon Iver , Drake (I’m so crushing on him), and Britney Spears. I love a good mix. Tell me about your ideal day. What do you do, where do you go, who are you with? My ideal Saturday when I am in NYC is thrift shopping in the morning, lunching in the West Village near Christopher St. with my boy Bradley (perfect for people watching), and ending the night with my bestie Ashlan and friends dancing at The Woods in Williamsburg. Anything I should have asked that I didn’t? Tell me one more thing I should know. I just graduated 6 months ago with my MBA in Entreprenuership and Marketing. Following my love of styling, thrifting, and education in business I am in the works to start my own vintage e-commerce fashion site! So excited to expand my fashion portfolio. What are you loving on Copious right now? These Iphone cases are edgy and make you look twice. Me needing this vintage piece is an understatement. This DIY spiked and bleached denim jacket is major! I love that these Finsk wedges have both a wood heel and architectural detail.